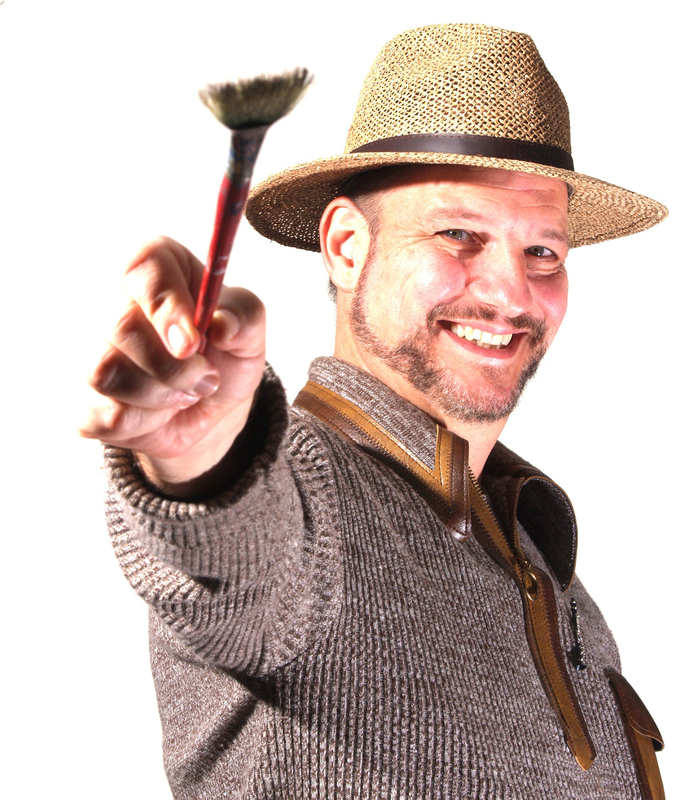 As an “art spirit” Robert seeks to expand and share his knowledge and experience with others; this outreach includes teaching classes, presenting instructional DVDs, workshops, lectures and demonstrations, entitled The Power of Positive Painting©. As host of the acclaimed TV program, “Art Beat,” which aired for two seasons (2003-2005) on PBS in Detroit, his goal was to make the visual arts more accessible to the people. Robert is also an accomplished actor, director and musician, videographer, Blogger, making connections between a variety of artistic disciplines. As an artist and a humanist, he seeks a meaningful exchange with his sitters, with the goal of creating portraits that express something of the soul of the subject. As a fine artist and commission portrait artist Robert Maniscalco has created and sold over 950 major works of art since launching his career in 1979. These works hang in private and public collections throughout North America. He creates about 12 – 15 portraits every year. He also has created seven themed bodies of fine art, including his latest, The Quench Project. He has won national awards and been widely collected, earning his living exclusively as an artist all these years because of his dedication to the highest standards, his deep love of people and desire to connect; essential qualities not only of a successful portrait artist but of any creative. Robert has created the portraits of many prominent individuals and their families. Responsibilities included Curating of Exhibitions, Marketing/Research, Graphic Design, Communications/Sales, Artist Management, Art Dealer, Art Consulting/Interior Design, Training, Events Planning/Execution, Managing a Custom Framing Business, Community Outreach, Rental of gallery space, Human Resources, Budget/Finance, Sales training. Presenting workshops, demonstrations, classes, Managing Guest Instructors. Accomplishments: The Maniscalco Gallery was founded in 1997 by Robert Maniscalco as an exhibition space and contemporary art center representing talented local and international artists, both established and emerging. The MG presented six major exhibitions each year and had become a major gallery venue in Detroit’s burgeoning art scene until the brick and mortar operations closed in 2005. The Maniscalco Gallery was an opportunity to reach out into the community and bring together the art of fine portraiture in the context of a contemporary art gallery. The Maniscalco Gallery hosted critically acclaimed exhibitions and special events like Salons, presenting poetry, song, dance, story telling, monologues, discussion and performance art in the context with the visual arts. Generated extensive media coverage and attention. The MG rose to prominence quickly, with as many as 400 people attending our events. Other special arts events were periodically presented at the MG, such as Wine Tastings, Vernissages, Salons, Poetry/Performance and painting parties. The Maniscalco Gallery also presented extensive Community Outreach Programming, including Fresh Art Festivals, Wine and Art tastings, Charity Auctions as well as special touring exhibits in non-traditional venues such as night clubs, restaurants, parks and private clubs. The Detroit Tasetefest (New Center Area), the Detroit Yacht Club, the Grosse Pointe Hunt Club and the Roostertail are examples of past outreach venues in which the Maniscalco presented programs. The Maniscalco Gallery Online continues to offer world class portraiture, fine art, art instruction, painting parties, career coaching and workshops, videography services, special events and a speakers bureau. 1997-04 Subject of over 45 newspaper/magazine articles, radio and TV interviews. WWNO Public Radio Spring Festival – interviewed about the state of the arts in N.O. Art Beat,Art Beat, host of this arts magazine on PBS in Detroit, profiling over 36 visual artists and reaching up to 75,000 airing twice a week, the highest viewership of a locally produced show in WTVS history. Responsibilities included writing/editing, researching, interviewing artists, fact checking, direction, co-producing, logistical, curation, planning. Inside Art – Host and producer over 60 Episodes, focusing on local arts & culture, for WMTV-5 Cable TV in Grosse Pointe/Harper Woods, MI Responsibilities included writing/editing, researching, interviewing artists, fact checking, direction, co-producing, logistical, planning. Wayne County Council for Arts, History & Humanities – Responsibilities included fundraising, heading a 12 member board, directing programming, motivating volunteers to execute innovative programming, building coalitions between arts and Social Service agencies, Executing programs. Accomplishments during Presidency (2000-2003): established WCCAHH as a 501(c)3, increased annual budget from $8,000 to $65,000, created and expanded programs, including Artists Among Us Exhibition (a creative collaboration between poets, musicians and artists), Fresh Art Project (artists painting au plein air, followed by a live “fresh art” auction), Wayne County Recognition Awards, Compilation of History for publication, Building of a public art collection in Wayne County and created Detroit Artist Network to create directory and reduce redundancy between arts organizations in Wayne County, designed Arts Mentoring projects. ARTnerships include collaborations with COTS, St Vincent DePaul, and the Warren Conner Development Coalition. Youth on Stage – Presenting ongoing acting/coaching to young actors, Grosse Pointe Theatre, Grosse Pointe, MI – Also, Acting classes for adults and children at the Grosse Pointe War Memorial. The Power of Positive Painting, created a comprehensive instructional video on portrait painting airing on NOETC, Acadian Public Access – Educational TV stations and sold as a video through American Artist Magazine. Musica da Camera, New Orleans – Sing with this award winning early music ensemble, recording on the Centour label. Actor and Director in over 40 award-winning New York stage and regional film, television and theatre productions. See separate “theatre” resume. New Renaissance Chamber Artists, New York City – Lead actor and Development Director for this contemporary music/theatre ensemble. Generated over $28,000 in grants (including NEA) and commissions for new works and performed at venues such as Weill Recital Hall and Baltimore’s First Night Festival. Also, through The Juilliard School Outreach Program – Created, presented and taught “new music” and story telling to grades K-6, 300 students per assembly.